Kala Namak, or Indian Black Salt is a special type of mineral salt from India. It is a volcanic rock salt mined in central India. 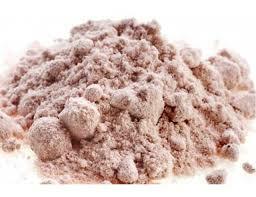 The ground salt is not black but more of a coral pink or pinkish grey. These colours come from the presence of trace minerals such as magnesium, as well as volcanic iron. Kala Namak is used in Indian cuisine as a condiment, most commonly with snack foods. It is used in chaats (fruit glazes), chutneys, raitas (yogurt and cucumbers mixes), fruit salads, and savoury deep-fried snacks. This finishing salt has a strong sulfur taste and smell. While this unique quality is often diffused when cooked, it nonetheless adds the taste of eggs.